Please help in starting Tidal on Snakeoil. After the mpd the system sounds great, I need Tidal. I tried to configure it, but unfortunately I can not. I configured the snakeoil as on the attached screenshot. When I publish the BubbleUPnP disc in Tidal's apk, unfortunately there is nothing in Bubble. I'm writing a message about a non-configured Tidal account. In BubbleUPnP, of course, the rander is set to UpMpd and library on MinimServer [hpt5741]. What am I doing wrong?? Please help me start Tidal. Without Tidal, I can not imagine my life. PS: It would be good to write a tutorial on the configuration of Tidal in Snakeoil. Many users would be grateful. I am concentrating on working on Tidal (and hopefully Qobuz) for MPD for the next release. Once I have a working version I will post up something in the manual. Hope can have you patience :thanks:. At the moment in the midst of upgrading the network for my home lab - to make things easier for development work. Once the network config is finished I will work proper on Update #2. Oh yes, the possibilty to stream Tidal with snakeoilOS would be a dream! (24-Nov-2018, 06:34 PM) Evach Wrote: Oh yes, the possibilty to stream Tidal with snakeoilOS would be a dream! Tidal and Qobuz support in MPD will only be available in v20. v18 and v19 was inferior to v17 in SQ but I think I can't pick the difference between v17 and v20 then (tested 1 or 2 years ago now so things may have changed). Hopefully can get working on U2 soon, revamping my home network is really a lot more difficult (and tedious) then anticipated. Hope I can have your patience. Once all this infrastructure is cleaned up, things will be way way more streamlined then. No problem, we can understand of course! But you mention the native installation of MPDv20+upmpdcli in your manual, have we missed something? 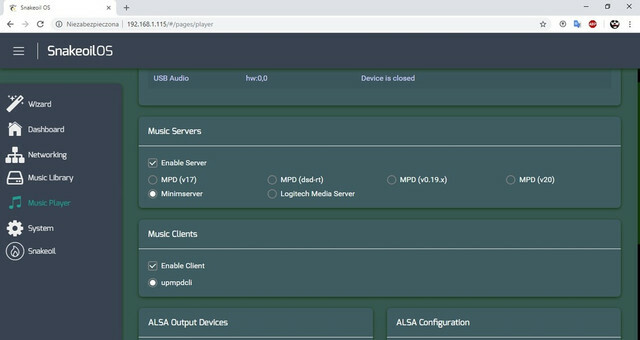 I have tried to connect MPDv20 as upnp without any succes. (27-Nov-2018, 04:40 AM) Evach Wrote: `No problem, we can understand of course! Once updmpdcli is installed, you should see a new select option "mpd+upmpdcli" under player server. Yes, it works!! Funny thing, i have "upmpd" option under "server" and also under "client", and both works trough upnp and mpd. There is any difference? I have already minimserver on my nas, it is better to choose "client" option? I cannot verify what is transfert to my dac (i don't have inputs information visible), but Mconnect indicate "24bit 48kHz 1744Kbps for MQA Original 192kHz" which is not bad and the usual conversion for non-MQA dac. Frankly speaking, i am not sure it was a major improvement compare to classical 16/44.1 stream, MQA streams have a compression and there is a necessary conversion at the end. But never the less, Tidal works and snakeoilOS is open to the entire musical world. (27-Nov-2018, 07:33 PM) Evach Wrote: Yes, it works!! Funny thing, i have "upmpd" option under "server" and also under "client", and both works trough upnp and mpd. There is any difference? I have already minimserver on my nas, it is better to choose "client" option? They are the same. There are some circumstances where upmpd will appear under client (one of the players will do t his), that's the limitation of the Snakeoil GUI at the moment. It's something I am going to work on to improve in the future. i.e. no distinction of client/server - just select the players you want to start, and they'd start it all up. That change should make it a lot better (hopefully). Maybe that's the "first unfold"? Interested to know more about MQA but alas don't really have the setup for it yet. This codec is so dividing, and there are so many "experts" on the Internet saying how bad it is and so on.. Yet the funny thing is - how can these people already be experts when there isn't really any content easily available to make any proper evaluations? You are right ;-) Compare some devices/setups with our ears, with our systems (and be aware about their limitations and perception bias). Some listenings of big and well set sytems help to know what is possible to obtain in terms of SQ, and stop loosing our time with unimportant details. In my case, after somes tests between Tidal MQA stream and Tidal FLAC stream of same songs, difficult to say what is better... MQA is not an huge improvement in my setup for sure, i can live without easily ;-) But of course, if a way is clearly identified to optimize HD MQA stream, it will be cool!